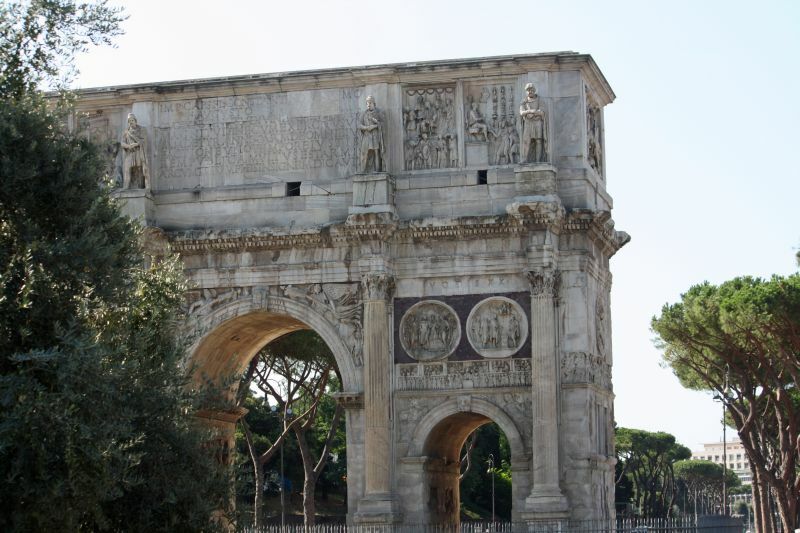 The Arch of Constantine (Italian: Arco di Costantino) is a triumphal arch in Rome, situated between the Colosseum and the Palatine Hill. 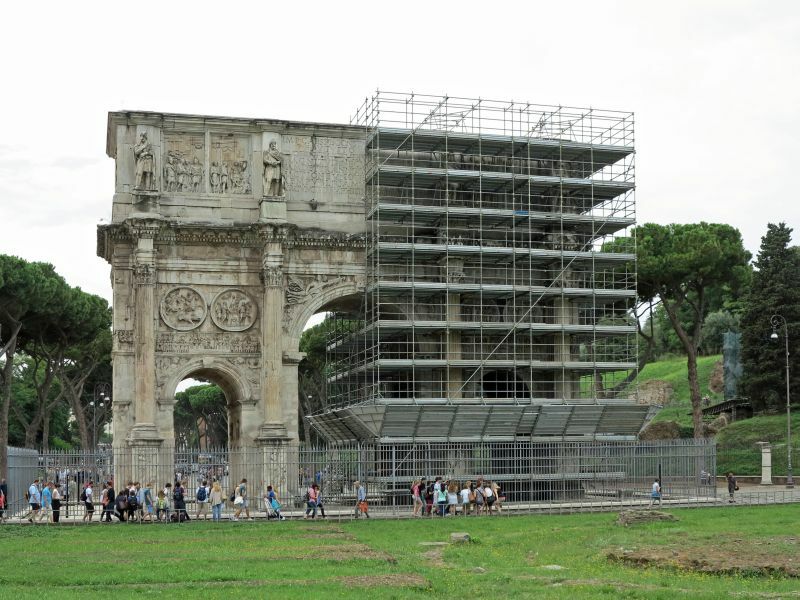 It was erected by the Roman Senate to commemorate Constantine I’s victory over Maxentius at the Battle of Milvian Bridge in 312. 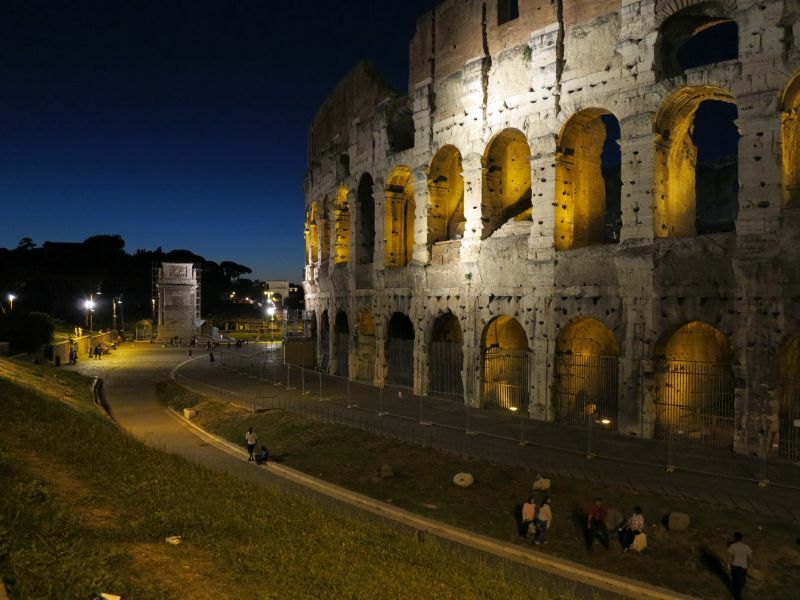 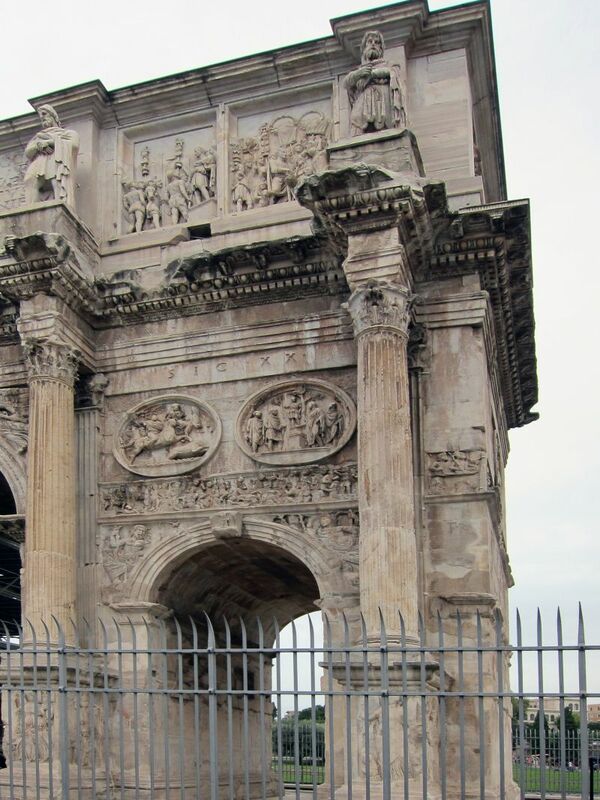 Dedicated in 315, it is the largest Roman triumphal arch. 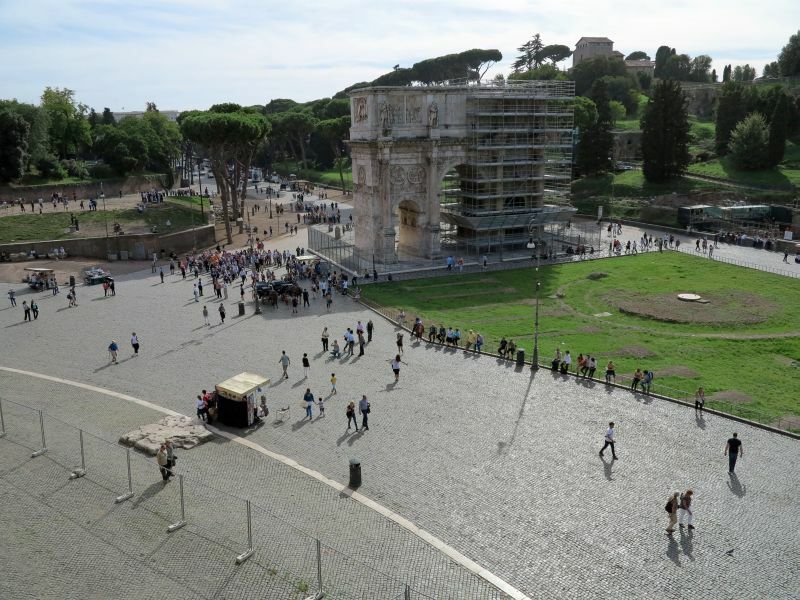 The arch spans the Via triumphalis, the way taken by the emperors when they entered the city in triumph. 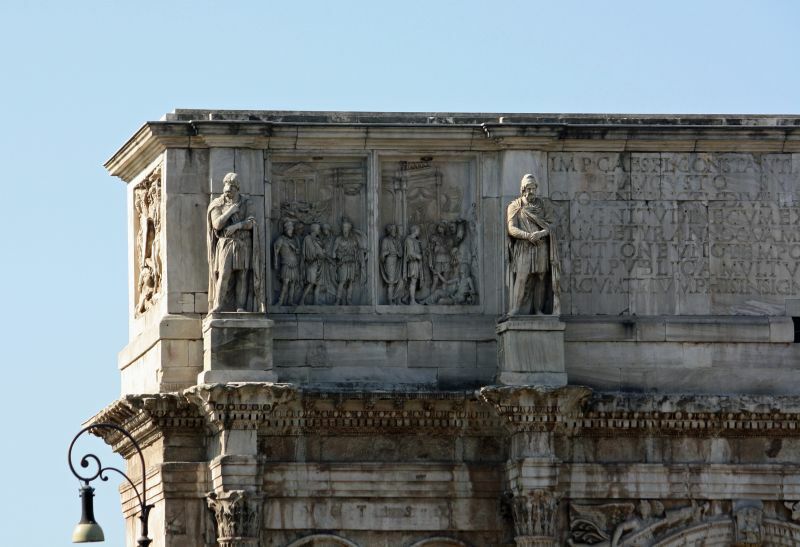 Though dedicated to Constantine, much of the decorative material incorporated earlier work from the time of the emperors Trajan (98–117), Hadrian (117–138) and Marcus Aurelius (161–180), and is thus a collage. 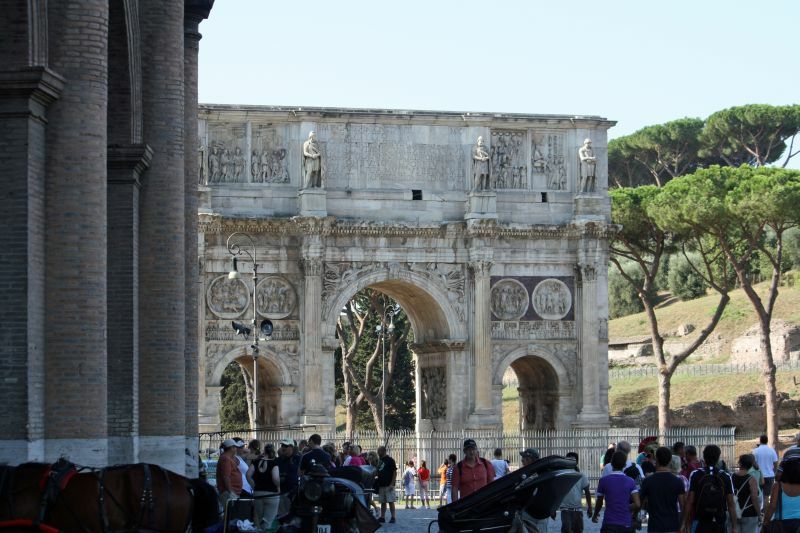 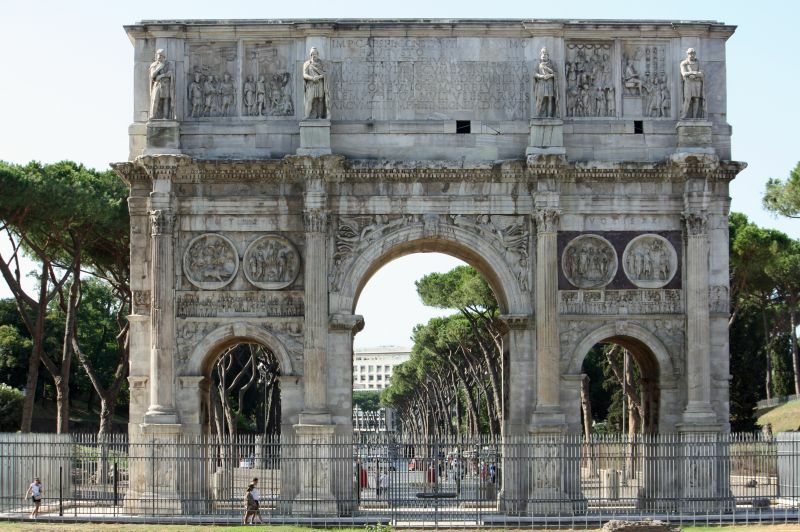 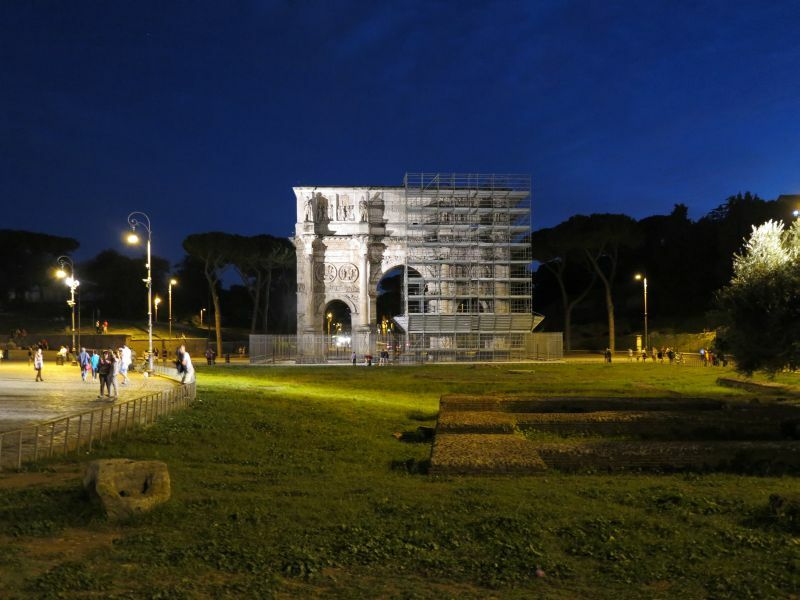 The last of the existing triumphal arches in Rome, it is also the only one to make extensive use of spolia, reusing several major reliefs from 2nd century imperial monuments, which give a striking and famous stylistic contrast to the sculpture newly created for the arch. 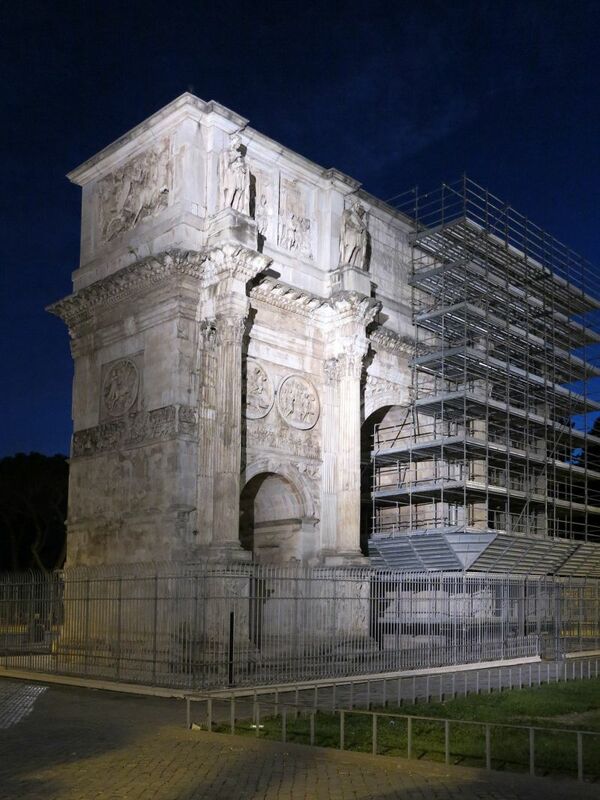 The arch is 21 m high, 25.9 m wide and 7.4 m deep. 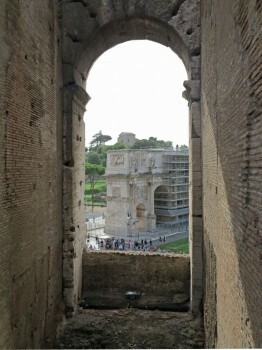 It has three archways, the central one being 11.5 m high and 6.5 m wide and the lateral archways 7.4 m by 3.4 m each. 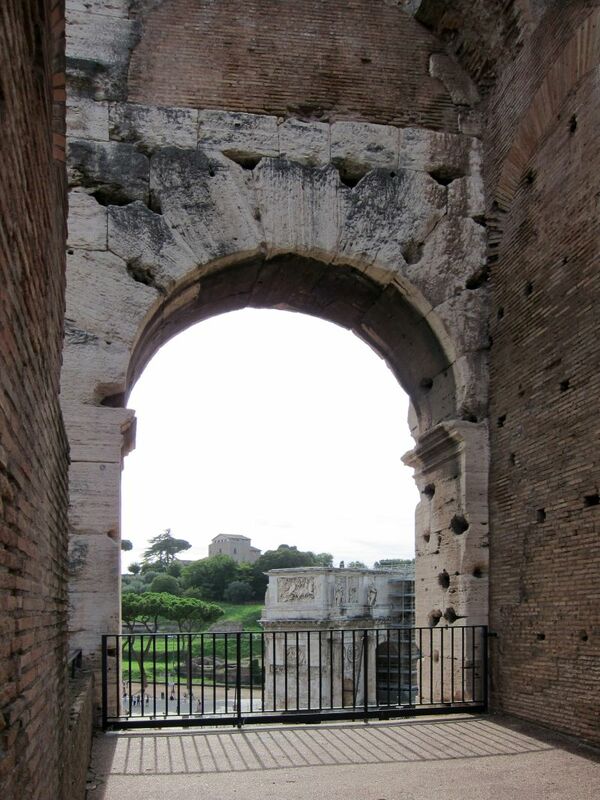 Above the archways is placed the attic, composed of brickwork reveted (faced) with marble. 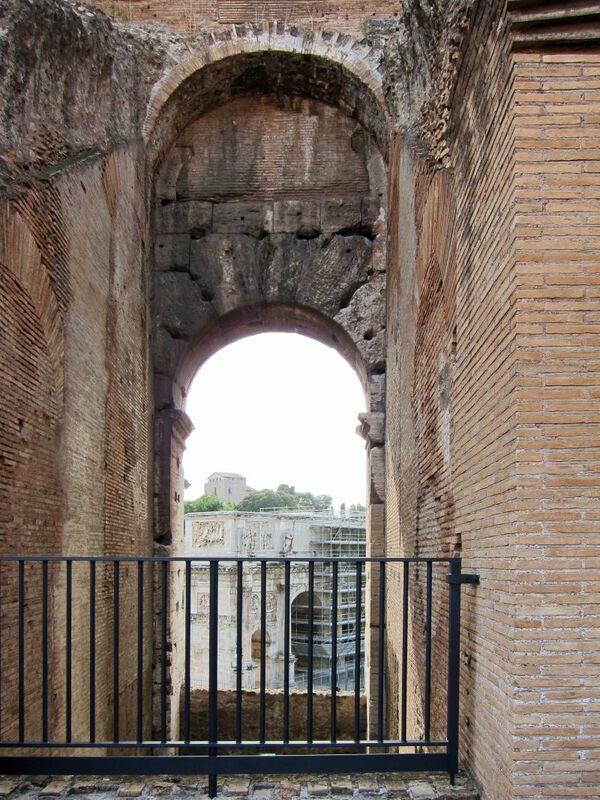 A staircase within the arch is entered from a door at some height from the ground, on the west side, facing the Palatine Hill. 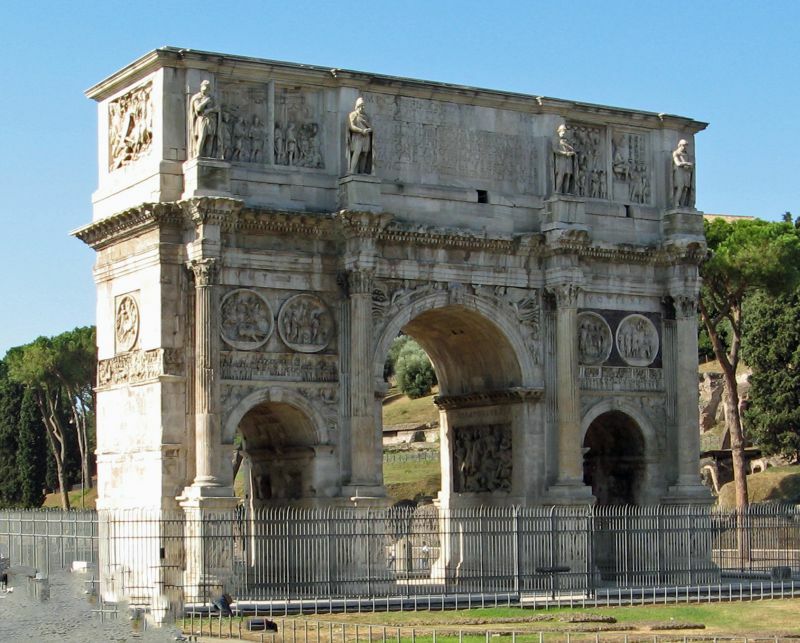 The general design with a main part structured by detached columns and an attic with the main inscription above is modelled after the example of the Arch of Septimius Severus on the Roman Forum.